I’ve spent the last six years getting to know Clementine. Like many people, I tuned into The Walking Dead toward the end of 2012, experiencing the troubles of Lee and his ward Clementine all in a blur when the first season ended. It was a good game with a lot of “earned” narrative beats. It rarely felt cheap, and when the ending rolled around many of us genuinely felt like we had been through a journey with highs, lows, and a whole host of weighty choices that felt like they belonged in a videogame. Later this year, Clementine’s story is going to be coming to an end. If you told me in 2012 that I would ambivalent about that fact, I wouldn’t have believed you. One of the greatest boons to storytelling in our current media environment is longevity. Infinity War, the capstone of the Marvel Cinematic Universe, works because we’ve sat through hours and hours of previous films that this film can build off of. Because it does not have to replicate work, it can tell a more complicated, scattered story with characters we’re already familiar with. Similarly, the so-called “Golden Age of Television” that we are in (or were in, depending on who you ask) works through extended time commitment. Sketching long, involved stories with complicated ups and downs is what makes shows like Breaking Bad, The Americans and Westworld work. Their prestige is a product of the amount of time we spend with them and how much we are rewarded for investing that time. When videogames lean into this, there are some special things that can happen. Soap McTavish’s saga in the Modern Warfare games is maybe the most traditional blockbuster movie-mimicking one. The longform storytelling in the Assassin’s Creed games, with their Desmond-focused plots and then the side stories that fill out the universe, as well as the transmedia properties of novels, comics and a film, reward someone who wants to pay close attention and connect the dots. videogames can really make the most of that time function of attention, and they can pack a player’s experience full of clear plot and narrative context, not to mention environmental design, that rewards explicit investigation and emotional investment. This is what makes the Dark Souls franchise so compelling for many of us, for example. The Clementine-focused Walking Dead titles that we have gotten from Telltale have all had the benefit of time. 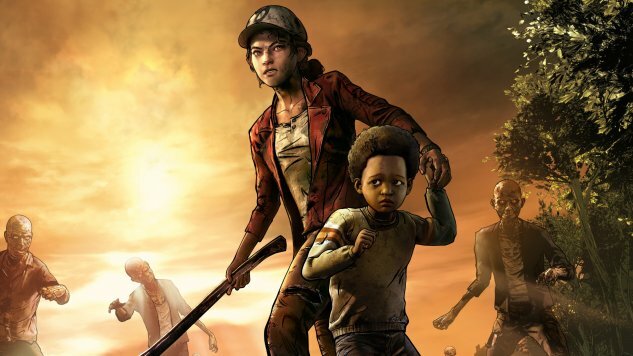 Season 1, Season 2 and A New Frontier have been releasing regularly since 2012, and they have all followed, to greater and lesser degrees, the child Clementine from childhood to adolescence. Typical of the post-apocalyptic zombie genre, they’re grim and gritty, asking the player to make hard choices about who lives and dies. There are heroes, bullies, victims, and the damned. At their best, they provide a platform for really thinking through the emotional implications of your actions, and the simple “[character] will remember that” in the upper right corner of the screen that could appear after any given choice is enough to make a player spiral into what-ifs. If it’s all so great, then why aren’t I excited about the final season appearing? The problem is that the games have no coherent identity to them. The other series that I mentioned above, Modern Warfare and Assassin’s Creed and Dark Souls, all have a consistent tonal identity to them. I know what to expect, and within those expectations, the games allow me to explore them and invest my time into them. But Lee’s adventures with Clementine were hopeful and melancholic at the same time. All the characters were in the process of losing things, and that loss meant something. As I wrote here at Paste, the second season is so invested in suffering for the sake of suffering and end-of-the-world tropes that it made me think that it might be better for the series to simply stop. It didn’t, of course, and the third season was so tonally off-putting to me that I didn’t even make it through the entire season. What began as an investigation about relationships and hard choices at the end of things turned into gleeful pain and apocalypse tropes, like a mutated DNA strand warped far out of shape in its adaptation of a TV show adapted from a comic adapted from a vast amount of zombie media. There’s no focus other than plot, no moments for quiet thought, no ambiguity about the whole project. Where other media and other games have shown that you can take an audience’s investment and really spin it into something special and rewarding, everything tells me that the last season of The Walking Dead is going to disappoint. And, look, I’m going to play it because I need to know. There is nothing I want more than to be proven wrong here. But all of that time, all of that thought, that I have put into the series is working against the game. Like Clementine, I had to work my way through all of those choices, all of those tones, and all of those disappointments. The game’s final season is meant to be a capstone, a send off to this universe six years in the making, and I hope it’s an excellent one. But I’m worried that it’s going to make me yearn for a world that could have been, and that’s never where you want an audience to be.